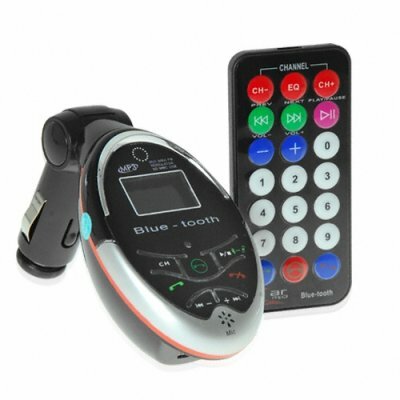 Successfully Added Easy MP3 Car Kit - Simple Bluetooth Calls + Music to your Shopping Cart. Easy to use MP3 car kit has simple bluetooth and entertainment functions along with handsfree bluetooth functions for todays cell phones. This handy little gadget has managed to combine two of todays most popular add-on technologies for the car and build them into one device. The Bluetooth FM transmitter will pair with your mobile phone allowing you to converse with others with the attached microphone and listen on your cars speakers by using the FM transmitter! You can also listen to your MP3 collection using the FM transmitter, it is as simple as plugging in a USB stick or SD card and hearing the beautiful digital sound over your own cars stereo system. When you answer a call your music will be paused automatically and when the call is ended the music will resume. This product is easy to install, simply plug it in to your cigar lighter, choose a frequency for the unit, tune your radio and your set. The unit also features rewind, pause and fast forward controls for simple music navigation. In the age of Bluetooth a handsfree car kit has become a necessity, by pairing this simple unit to your car stereo you can listen to your tunes and never miss a phone call! Order today for yourself or sell to potentially millions of customers on eBay and use Chinavasions excellent drop shipping service. If you wish to make comments or reviews about this product, please use the product review. Please feel free to open an inquiry ticket if you have questions about this product. on 2009-05-10 14:04:22 easy recomendation!